Eye masks and ball masks. 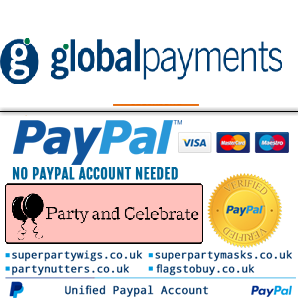 Eye Masks are a large part of the Super Party Mask online store. Buy fancy dress masks now from 99p and receive over night delivery on orders before 3pm. Make a difference to your costume and fancy dress with eye masks originating from the traditional carnival Domino eye masks to super hero disguises and Venetian inspired masquerade eye masks - All available, some exclusively, at Super Party Masks. The Domino Eye Mask from Venetian carnivals quickly became the 18th century classic. Eye masks of todays masquerade range far wider in style however. The familiar cat eye mask with whiskers, half face eye mask (Phantom of the Opera), Venetian inspired long nose eye masks, laced eye masks, sequin eye masks, Zorro's eye mask, another classic - the 'burglar' eye mask and devil eye masks are all available right here at Super Party Masks.